Daryl Johnson (Worcester Park, United Kingdom) on 7 February 2008 in Architecture. Ahhh! Of course! I love these tiles and never manage to capture them JUST as I feel...they evade me. 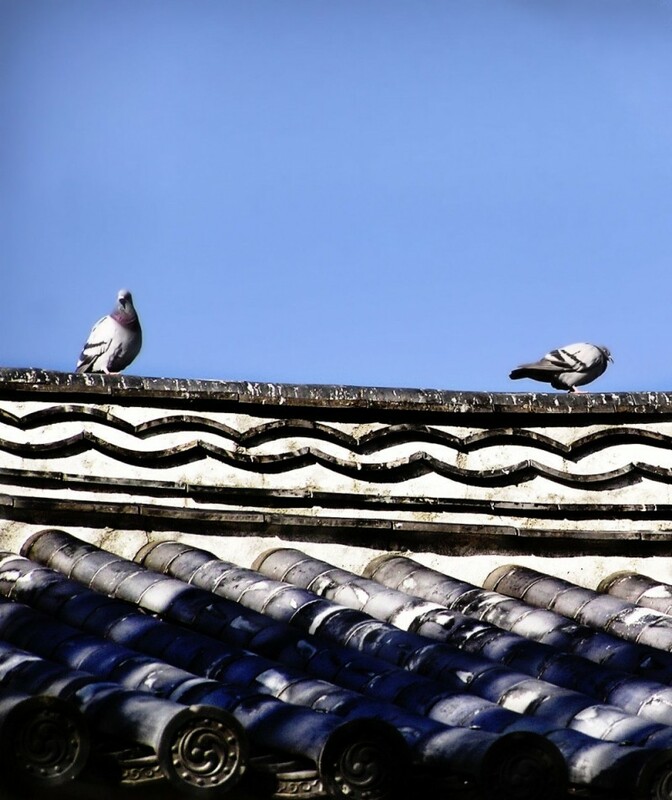 Even the tiles are artistic in Japan, they form such beautiful patterns!I love the tonality here and the dappled light caressing them!The pigeons impart some life to the shot, but we know that they also "paint" white many of such locations.The accent of the one crest bearing round tile (lowest left) is very pleasant, almost like the artist's stamp. @Japanalia: Thank you Gabriela, I'm glad you liked it! Interesting capture, I think there might be a bit too much sky, but it's still lovely! @yiannis krikis: Thank you yiannis. cute. well titled. i don't think the birds know it's a castle though. @danthro: I don't imagine so! Thanks danthro. A really nice composition, I like the shapes and curves of the roof tiles too. This is a very nice picture. Beautiful details on the roof. I also like the round tile in the light in the foreground but it seems that it is not what you wanted to show as it is out of focus and there is not enough space below. I would have prefer only 1 pigeon (the one on the left) even if we don't see much his head.